A stunning coast, beautiful hills to walk in and the wildlife rich Dee estuary. The Clwydian Range is designated as an Area of Outstanding Natural Beauty, and the Offa's Dyke path runs through here to Prestatyn. Don't miss the panoramic Horseshoe Pass, and the famous Pontcysyllte Aqueduct and Llangollen canal. A superbly appointed impressive two storey luxury lodge. Ground floor: One master king size double with ensuite bath with overhead shower. Spacious open plan living/dining area with vaulted ceilings and floor to ceiling windows. Modern fully fitted kitchen. First floor: One double with ensuite bath with overhead shower, one double and one with bunks. Bathroom with walk in shower. Large decking with garden furniture and barbecue. No pets.. Penvale Lakes Lodges is part of our Evermore Lodge Holidays Collection, beautifully tucked away in a secluded 33-acre valley on the edge of the picturesque riverside town of Llangollen. Encompassed by breathtaking dramatic scenery, this is the ultimate exclusive retreat for the family seeking to get back to nature. These stunning Canadian-inspired lodges command relaxation! From the magnificent wall of windows framing the poetic landscape to each exacting detail of home comfort, or the fabulous outdoor pool to summer evening barbecues, this is family holiday heaven. Boasting the Fron Fawr Mountain as a backdrop, outdoor pursuits abound – white-water rafting, canoeing, fishing, climbing, cycling and nature walks all feature locally. Snowdonia National Park is just one of countless scenic and cultural delights within easy reach.. Penvale Lakes Lodges is part of our Evermore Lodge Holidays Collection, beautifully tucked away in a secluded 33-acre valley on the edge of the picturesque riverside town of Llangollen. Encompassed by breathtaking dramatic scenery, this is the ultimate exclusive retreat for the family seeking to get back to nature. Woodland walks. All facilities available for all dates. 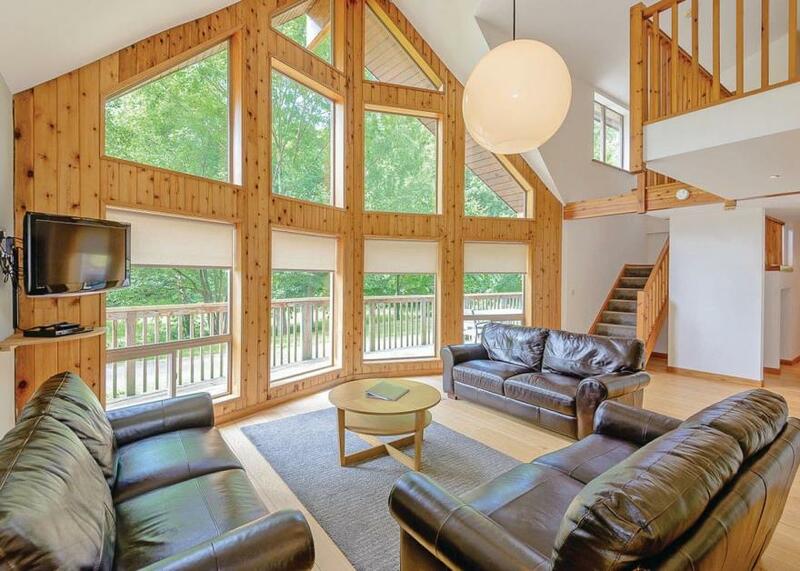 A superbly appointed impressive two storey luxury lodge. Ground floor: One master king size double with ensuite bath with overhead shower. Spacious open plan living/dining area with vaulted ceilings and floor to ceiling windows, some with log burning stove, (please check when booking – first supply of logs included). Modern fully fitted kitchen. First floor: One double with ensuite bath with overhead shower, one double and one with bunks. Bathroom with walk in shower. Large decking with garden furniture, barbecue and outdoor hot tub. No pets.. Penvale Lakes Lodges is part of our Evermore Lodge Holidays Collection, beautifully tucked away in a secluded 33-acre valley on the edge of the picturesque riverside town of Llangollen. Encompassed by breathtaking dramatic scenery, this is the ultimate exclusive retreat for the family seeking to get back to nature. A superbly appointed impressive two storey luxury lodge. Ground floor: One master king size double with ensuite bath with overhead shower. Spacious open plan living/dining area with vaulted ceilings and floor to ceiling windows. Modern fully fitted kitchen. First floor: One double with ensuite bath with overhead shower, one double and one with bunks. Bathroom with walk in shower. 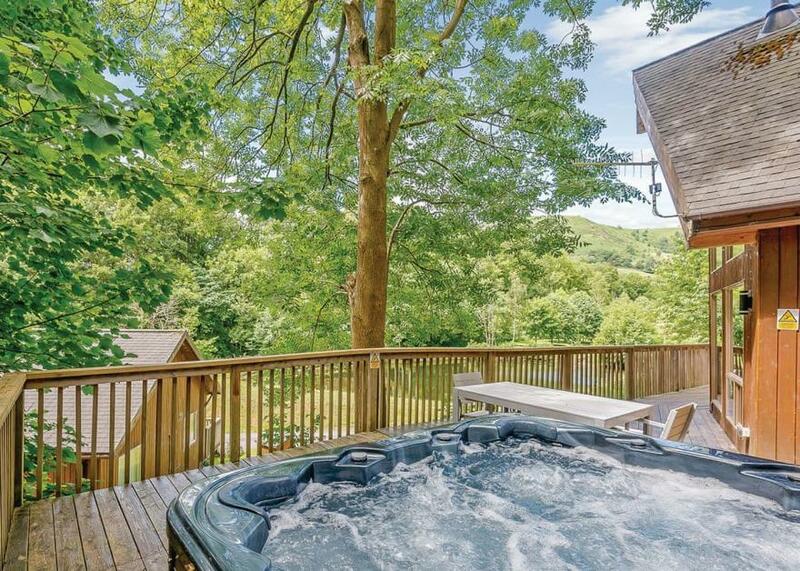 Large decking with garden furniture, barbecue and outdoor hot tub.. Penvale Lakes Lodges is part of our Evermore Lodge Holidays Collection, beautifully tucked away in a secluded 33-acre valley on the edge of the picturesque riverside town of Llangollen. Encompassed by breathtaking dramatic scenery, this is the ultimate exclusive retreat for the family seeking to get back to nature. New in 2018. Luxurious lodge with one master double with ensuite shower and two twin. Towels included. Outdoor hot tub.. At Marine Holiday Park you enjoy a setting close to the centre of famous Rhyl, with its 3 miles of sandy golden beach and exciting attractions. There is a superb tropical indoor heated pool, a poolside bar and live family entertainment from top class cabaret acts in the newly refurbished Mariners Club. You can join in the dancing or simply enjoy a drink and soak up the relaxing atmosphere.. At Marine Holiday Park you enjoy a setting close to the centre of famous Rhyl, with its 3 miles of sandy golden beach and exciting attractions. 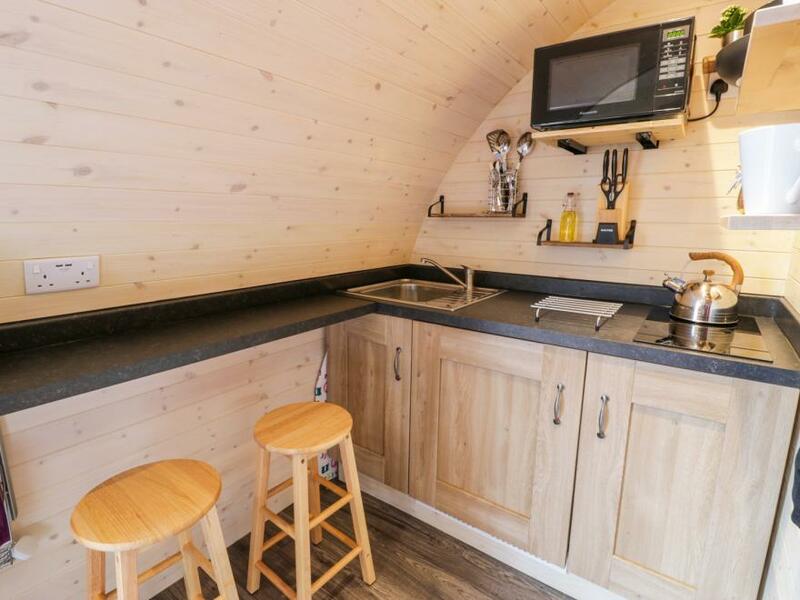 Talking Trees is a beautiful and cosy Shepherds Hut. It is based within the owners grounds but is privately gated. It will accommodate two people. Along with the hut comes a large private grassed/wooded area. There is a fire pit, barbecue and garden furniture in your own space. The hut has a real toilet and a small wash sink with cold water. There is a microwave and mini fridge. The hut has a comfortable bed and a number of cooking utensils also plates, glasses etc. There is a hot water gas camping shower set up outside with a sheltered wooden screen. There is also a gorgeous little caravan in the garden with gas stove and cooker, and kitchen sink. The caravan also has a hot water and a shower (takes 15 mins to heat). 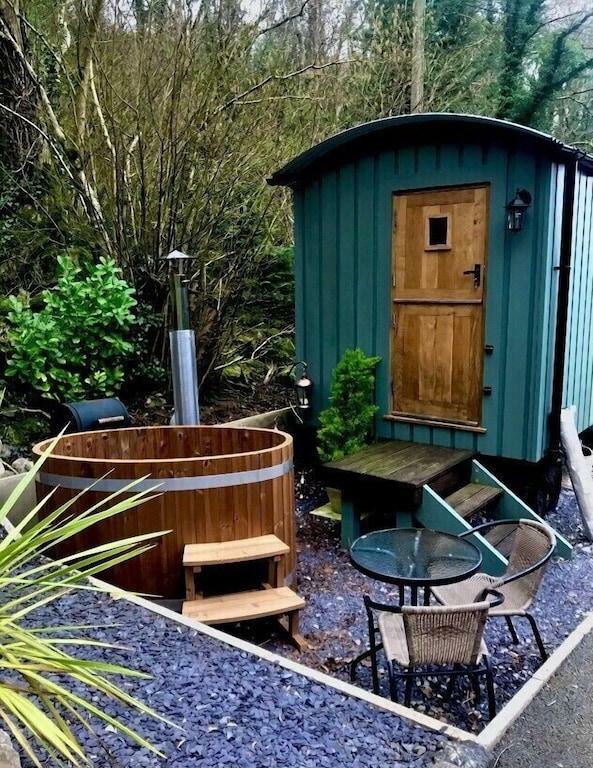 The hut is situated near numerous country walks and is in an area of outstanding natural beauty being close to Moel Famau (5 min drive) and not far from the coast. This is a great hut for those that enjoy camping, nature, walking, biking and good food. The hut is a ten minute walk to a friendly little pub (closed on a Monday) which has an excellent menu and a twenty minute walk to a village shop. This is an ideal stay to unwind and enjoy the sound of nature, to watch the bats stir at twilight and listen to the owls at sunset. We look forward to greeting you, then leaving you to enjoy your own space. We are always just a text away to help with any questions. If you enjoy the super natural and ghost hunting, this is the ideal place. Our resident and friendly ghost (The Miner) can often be seen walking the lanes and fields carrying his lantern. Fire up the barbaque, turn up the music and enjoy your own piece of the country. Pets are unfortunately not allowed as we have two beautiful and friendly bullmastiff who like there own space. Fallows is a fantastic, detached log cabin, situated on a development of six cabins surrounded by woodland near St Asaph in Denbighshire. 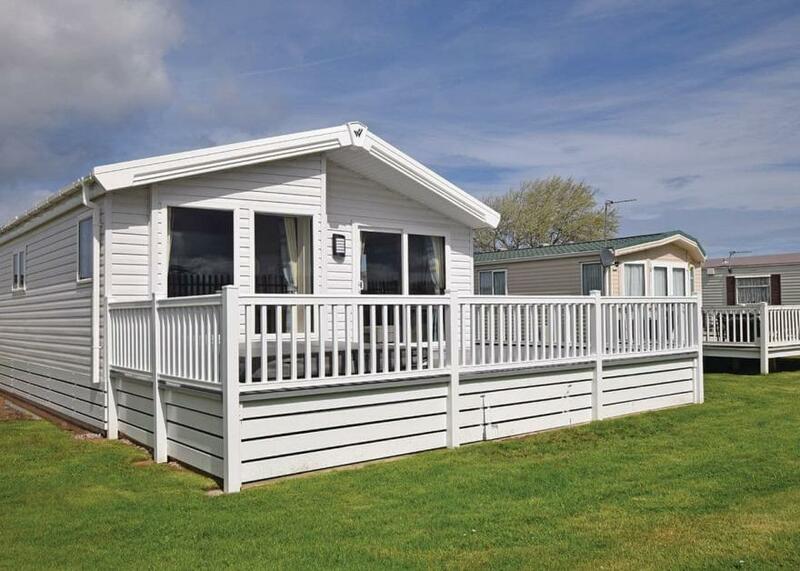 The cabin is set over a single storey with ramped, wheelchair access available, and offers a double bedroom with an en-suite shower room, a twin room, and a family bathroom. There is an open plan living area featuring a well-equipped kitchen, a dining area, and a sitting area with a woodburning stove. 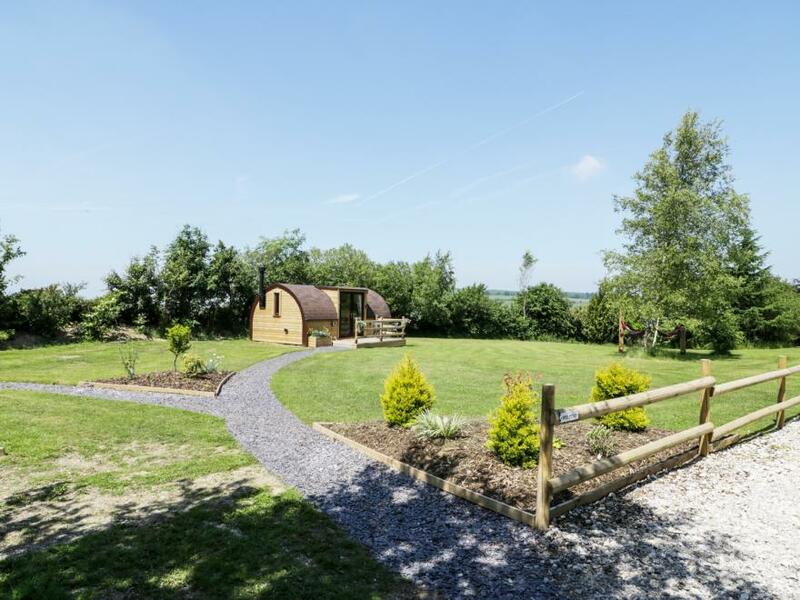 Outside, there is an enclosed, decked veranda with a hot tub and furniture, shared woodland play areas and lawns, and off road parking for two cars. Fallows is a fabulous base for discovering the delights of Denbighshire, all year round. 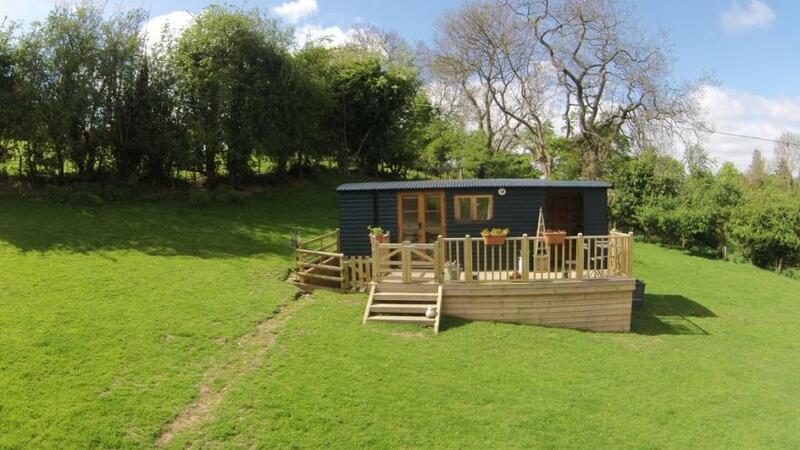 Gelert Pod is a stylish pod situated in St Asaph, Denbighshire. All rooms are located on the ground floor. It has one double with a separate shower room and WC. It has an open-plan living room with a fitted kitchen and dining area. Outside has a decking area with furniture provided and a barbecue available upon request. Off-road parking is available for two cars. 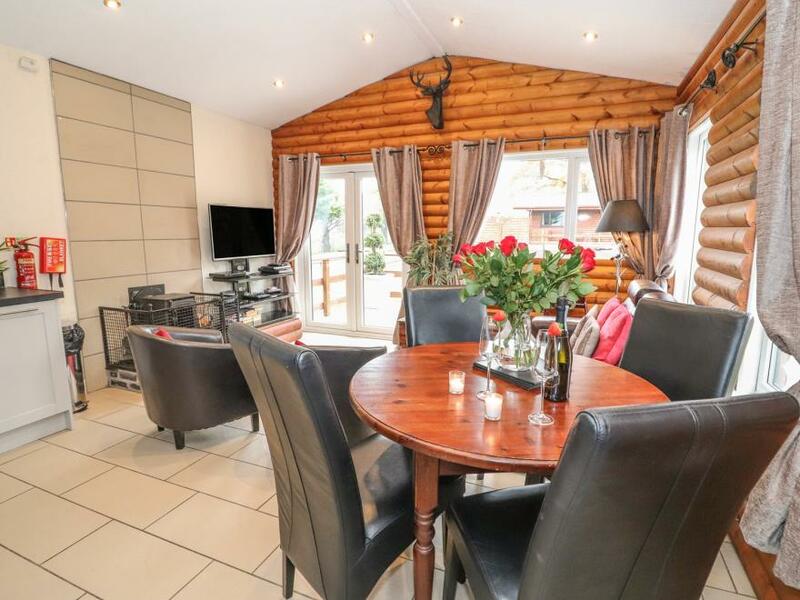 Cabin 1 is the perfect place for a cosy, romantic holiday.